it is the potential capacity of the human heart. 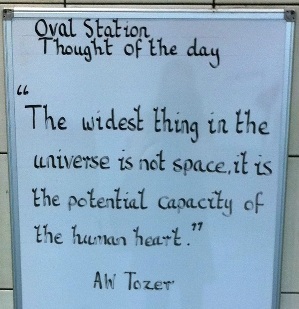 I came across this quotation in Oval tube (Underground) station a couple of weeks ago. A member of the station staff apparently writes up a ‘thought for the day’ on one of the station noticeboards every morning. He (or she) also plays gentle, soothing classical music over the ticket hall PA system. On the day I discovered this, I tried to take a photo of the noticeboard showing the above quotation. I was slightly annoyed at the couple taking an inordinately long time standing around in front of it, blocking my view and my photo while apparently having a deep discussion about it. I took my photo anyway, though from a slightly awkward angle, and was about to go on my way, when the couple stopped me. “Excuse me,” they asked, in heavily-accented English, “what does this word mean?” They indicated the word ‘wide’ and I explained “Ah! It is ‘big’?” They explained they had thought it said ‘white’ and had been puzzling over what it could possibly mean. With smiles and thanks, we went our separate ways, and I was left pondering the irony of the incident. So often Londoners – myself included – rush around, frustrated with people getting in their way, just trying to get on with their own lives. Then something makes them stop, smile, reflect and communicate. How appropriate that this time it was a quotation about the potential of the human heart! The heart of the station employee was big enough to prompt him to take a moment out of his day to put on some music and write a positive, encouraging thought on the board for all to see. The hearts of this couple were engaged by it and were soft enough to spend time puzzling over it, and then humble enough to ask for help. And my heart…? Well, it was, thankfully, just about soft enough to notice the quotation and pause to record it. It was initially frustrated by this couple, but hopefully it has now learned its lesson and expanded just a little to allow compassion for others to creep in. Thank you, whoever you are at Oval station! Hey Jennie, thanks for commenting on my blog! Sorry you didn’t win Billy Coffey’s book. I’m sure you’ll enjoy it. Hope to see you around again. Happy blogging! Thanks Matt! Really loved your interview with Billy (everyone, you should check it out , and buy a copy of Snow Day by Billy Coffey!). The question that’s stayed with me is “How did you discover what it means to write like Billy Coffey?” What a brilliant question, and deinitely something I’m going to give some thought to (though inserting my own name, obviously!). I do this all the time! I get impatient as I’m struggling through my day and forget that those things getting in my way are people; with emotions, hurts, needs, and thoughts. Remembering they’re human helps with it all. 🙂 Great post! Thanks Melissa! Nice to ‘meet’ you – thanks for stopping by. Yeah, I love living in London, but there are definite times I experience ‘pavement-rage’ (sidewalk-rage). Good to remember those things in front of me aren’t obstacles but humans!! PS loving your blog, by the way – great, great post on Happiness a few days ago – you should read it everyone! Melissa is great. She lets me beat her at Words With Friends (Scrabble) almost every day! Thanks, Jennie. I really appreciate it. Nice to “meet” you, too. 🙂 Glad I took Peter’s suggestion to head on over. Haha! Yeah, he’s my biggest promoter – hope he doesn’t start charging a fee! No, but i might make you come over and visit you nieces and nephew!